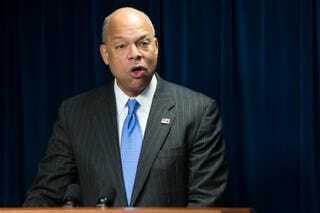 Today at massive security tech conference RSA in San Francisco, U.S. Secretary of Homeland Security Jeh Johnson told a packed audience that DHS would be forging alliances with Silicon Valley. He described plans to build an office here, in order to work directly with tech companies on key issues for the DHS. I am pleased to announce that the Department of Homeland Security is also finalizing plans to open up a satellite office in Silicon Valley, to serve as another point of contact with our friends here. We want to strengthen critical relationships in Silicon Valley and ensure that the government and the private sector benefit from each other’s research and development. This move appears to be a response to a growing rift between the government and Silicon Valley. DHS seems to want to position itself as a tech innovator, attracting engineers away from the private sector. At the same time, DHS wants to work with Silicon Valley companies, to “promote information sharing and cybersecurity best practices” as part of the Department of Homeland Security’s C3 voluntary program. Johnson also said the President has tasked him with encouraging “private Information Sharing and Analysis Organizations.” Broadly speaking, these are all efforts aimed at getting private industry to share critical information about infosec threats with the government. So this new DHS outpost is part of a much larger agenda to bring Silicon Valley companies into the national security fold. Johnson also emphasized that DHS has a specific agenda, which is to push back on the call for encryption that’s come from many tech companies, including Yahoo and Google. The current course we are on, toward deeper and deeper encryption in response to the demands of the marketplace, is one that presents real challenges for those in law enforcement and national security. Let me be clear: I understand the importance of what encryption brings to privacy. But, imagine the problems if, well after the advent of the telephone, the warrant authority of the government to investigate crime had extended only to the U.S. mail. Our inability to access encrypted information poses public safety challenges. In fact, encryption is making it harder for your government to find criminal activity, and potential terrorist activity. We in government know that a solution to this dilemma must take full account of the privacy rights and expectations of the American public, the state of the technology, and the cybersecurity of American businesses. We need your help to find the solution. Let’s hope that the solution is not to encourage backdoors and key escrow so that DHS can decrypt whatever it wants. Read Johnson’s full speech here.